It's only the 2nd August, but June already feels much longer than five weeks ago. June was when we basked in unremitting sunshine - when we even had a mercifully brief, stickily uncomfortable heatwave. June was when barbecues and Pimms, bare limbs and toes abounded, when trees were verdantly lush and every leaf and bud was backlit with gold. June moved seamlessly into July, but after about a week, as I departed for the Forum, the temperatures and rain began to fall... and continued to do so. Yes, there have been some dry days, but they've mostly been relatively cool, with overcast skies from which the sun shines only in rare bursts, or only when it rises and sets. And today, though it's 2nd August, summer temperatures have most definitely segued into autumn, the sky is one huge cloudy grey, and the rain is relentless. Only vegetation's rain-washed bright greenness serves to remind me that it's still summer. So today seems a good day to find and share a photo taken in June's summer brightness; a photo filled with colour and charm, which, I hope, might raise a few of today's chilly and bedraggled spirits. I met this little beauty in the middle of June beside Oxford Canal, where he obligingly posed for photos and even allowed me to capture his best side. I was instantly captivated, both by his peacock-inky iridescence and his perky charm. 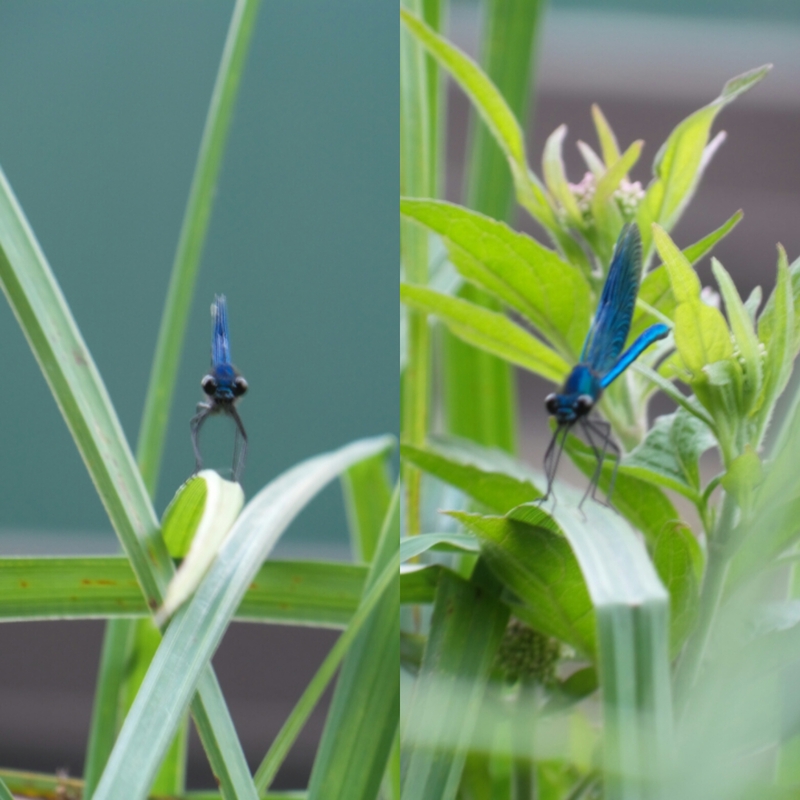 I was reminded of him a few days ago, when I read Jonathan Tulloch's paean to a Banded Demoiselle damselfly in last week's Tablet, and this encouraged me to find out more about him. And yes, he is a male, even though he's a damselfly, and, as I discovered, a Beautiful Demoiselle - the French word from which we derive damsel, and which speaks more of demure, blushing maidens than of lusty males! In fact, according to the website he was doing a very male thing for his species - resting on bankside vegetation, waiting for females. I don't know whether a fair damsel damselfly did indeed flutter by to make his evening, but I do know that for a few minutes, as he posed and goggled and flashed his brilliant wings at me, he certainly made mine. I love that!!! both are gorgeous posers!